Steve Martin. Robin Williams. Bill Murray. What do all of these people have in common? Obviously, they are amongst the royalty of American comedians/comedic actors. They made millions laugh and their humorous efforts still resonate today. What else do they have in common? They all tried their hand at dramatic roles to varying degrees of success. Williams won an Oscar for his serious role in Good Will Hunting, while Murray and Martin have had mixed review for their dramatic efforts. (The Razor’s Edge? Leap of Faith? I didn’t think so.) A newcomer to that list is Steve Carell. After making his make on The Daily Show and The Office, Carell has turned more and more to very serious movies. Is he making a serious mistake by going this route? Let’s explore Welcome to Marwen and find out. 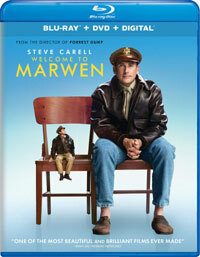 Welcome to Marwen tells the real-life story of Mark Hogancamp (Carell), a man who lives in a small town in New York. Following a brutal attack by a group of assailants, Mark, who was an illustrator, loses his ability to draw and has little memory of his life before the assault. He turns his artistic urges towards photography, building an elaborate scale model of a fictional Belgian town during World War II and inhabiting it with dolls who represent people in his life, mostly strong women who have helped him in his recovery. He plays out elaborate fantasies using the dolls and his pictures have garnered enough attention to inspire a gallery showing in New York City. However, Mark’s PTSD is very strong and he has trouble going out into the world and associating with strangers. That is, until he becomes intrigued by his new neighbor, Nicol (Leslie Mann). Welcome to Marwen comes from Oscar-winning Director Robert Zemeckis, who has been behind many classic films in his career, including Forrest Gump, Back to the Future, and Who Framed Roger Rabbit?. Zemeckis seems to fall into pattern where he gets hooked on certain things. From 2004-2009, he appeared to be obsessed with changing the face of motion-capture animation with The Polar Express, Beowulf, and A Christmas Carol. The problem was that the faces didn’t change enough. It appears that his next craze may be making dramatic recreations of documentaries. This began with 2015’s The Walk and it continues with Welcome to Marwen. In fact, Welcome to Marwen combines these two topics, as it tackles a real-life story and uses motion-capture animation. For once, the animation works, as the dolls…look like dolls. With all of this, Zemeckis seems to be losing his touch on storytelling. Welcome to Marwen is the compelling story of a man who is suffering from a terrible crisis. So, Zemeckis has decided to tell the bulk of the story from the viewpoint of the dolls. While the scene involving the dolls all symbolize things occurring in Mark’s life, the story-telling device quickly loses its appeal. The film opens with a scene which represents Mark’s attack, and it presents a unique way to invite the viewer into the story. However, the doll scenes soon lose their appeal. Zemeckis and Co-Writer Caroline Thompson have chosen an odd way to tell the story. It takes quite some time to learn exactly what happened to Mark, why it happened, and how it affected him. Once these details are revealed, Mark becomes a somewhat more sympathetic character, but the movie may have lost some viewers by then. I have not seen Marwencol, the documentary which inspired Welcome to Marwen, but I certainly want to. Welcome to Marwen introduces Mark and his story, but it raises more questions than it answers. The sad thing is that this isn’t some slight movie. The cast is full of familiar faces and the special effects could not have been easy to pull off. As for Carell, he’s solid in the role, but Mark is often difficult to like. I can’t say if that’s the character or Carell’s performance, but the film made me long for the return of Michael Scott. Welcome to Marwen has a few touching moments, but overall it doesn’t work as a drama or as a biopic. If nothing else, it simply feels like a long commercial for dolls for adults. Welcome to Marwen features a plot twist involving a Belgian witch which is simply baffling on Blu-ray Disc courtesy of Universal Studios Home Entertainment. The film has been letterboxed at 2.35:1 and the Disc contains an AVC 1080p HD transfer which runs at an average of 37 Mbps. The image is very sharp and clear, showing no notable grain and no defects from the source materials. The colors look very good, most notably reds and blues, and the image is never overly dark or bright. The level of detail is impressive, especially in the doll scenes, and the depth works quite well. The Disc carries a Dolby TrueHD 5.1 audio track which runs at 48 kHz and an average of 3.5 Mbps. The track provides clear dialogue and sound effects. The doll sequences contain (very graphic) battle scenes which deliver strong subwoofer and surround sound effects. We feel each explosion and the individual gunshots can be heard in the surround channels. The Welcome to Marwen Blu-ray Disc contains a small assortment of extra features. We begin with eight DELETED SCENES which run about 11 minutes. Most of these are brief moments which were cut from existing scenes and there are no new characters or subplots here. “Marwen’s Citizens” (4 minutes) provides an overview of the cast, with a look at each of the main characters and comments from the actors. “A Visionary Director” (5 minutes) has the cast talking about what it was like to work with Robert Zemeckis, while the filmmaker explains how he got involved with the project. “Building Marwen” (4 minutes) takes us on-set to see the creation of the small-scale town of Marwen, as well as showing how the dolls were made. The visual effects which went into creating the dolls are explored in “Living Dolls” (4 minutes). We see the layering which went into making these effects, as well as some on-set footage from the motion capture stage.